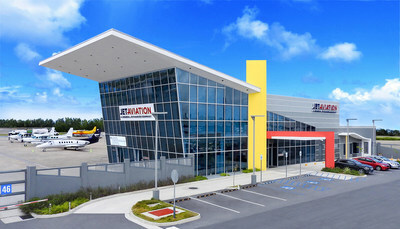 TETERBORO, N.J., Feb. 19, 2019 /PRNewswire/ -- Jet Aviation today acquired full ownership of the San Juan fixed-base operator (FBO) at Luis Muñoz Marin International Airport in Puerto Rico, a provider of premium business aviation services at one of the most convenient U.S. points of entry for international flights. Jet Aviation has been operating the San Juan FBO under a management agreement with the previous owner, Pazos, since March 2017, when the FBO was rebranded as Jet Aviation. "Bringing the San Juan FBO completely under Jet Aviation management reinforces our commitment to our customers, our employees and the region," said David Paddock, senior vice president and general manager, Jet Aviation Regional Operations USA. "Our goal is to deliver business aviation services as close to demand as possible, while ensuring consistency across our growing global network." "Jet Aviation operates 10 FBOs in the U.S. and Caribbean," said Paddock. "San Juan is a high-performing FBO with excellent long-term growth prospects and we are delighted to fully bring it into our fold." Paddock said a new, larger hangar will open in the first quarter of 2019 to replace the one destroyed by Hurricane Maria in 2017. The hangar – 20,000 square feet of hangar space and 2,500 square feet of office space – will offer customers parking facilities, refueling, third party aircraft maintenance, meeting space, an executive passenger lounge, flight-planning workstations and a pilots' suite. The San Juan FBO has a full-service, onsite U.S. Customs and Border Protection terminal to facilitate convenient customs, immigration and agriculture processing of international flights. Hector Vasquez will continue in his role as FBO director and serve as general manager at San Juan. He has worked in FBO services for 34 years and was at Jet Aviation Teterboro for 26 years before moving to San Juan in 2018. Jet Aviation, a wholly owned subsidiary of General Dynamics (NYSE: GD), was founded in Switzerland in 1967 and is one of the leading business aviation services companies in the world. More than 4,800 employees cater to client needs from close to 50 facilities throughout Europe, the Middle East, Asia, North America, and the Caribbean. The company provides maintenance, completions and refurbishment, engineering, FBO and fuel services, along with aircraft management, charter services and personnel services. Jet Aviation's European and U.S. aircraft management and charter divisions jointly operate a fleet of some 300 aircraft. Please visit www.jetaviation.com and follow us on twitter: http://twitter.com/jetaviation.